“Wine is a Mocker,” a 1670 Dutch print by Hendrik Bary after Frans van Mieris, is part of a popular genre of didactic art which depict scenes with multiple, anonymous characters engaged in everyday activities. 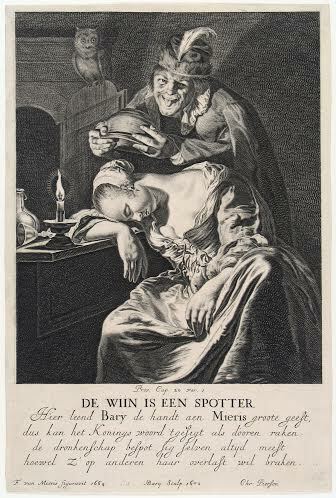 In this work, a sleeping woman and a mischievous, pot-pouring man are engaged in opposite activities, and yet are given equal importance, which complicates the genre convention of deriving a single moral from the art, and instead makes a critique of two different, but equally reprehensible, effects of drinking. The two characters are as far apart as can be. A woman sleeps while a man with a roguish expression empties the contents of his bowl over her head, and it is unclear which character, the sleeping woman or the man, is influenced by wine, or whether both of them show a different aspect of drunkenness. In the latter case, the woman is in a drunken stupor and therefore vulnerable, but the even, soft lighting on her skin gives her beauty. On the other hand, the man’s humorous face is rendered terrifying by harsh lighting; the dark shadow of his nose over his left eye reminds one of a black eye, and his expression is that of a flamboyant jester. Thus the play of light in the image captures two different effects of drinking, neither of which is flattering to the recipient.